“It’s a completely different atmosphere from New York in the days after 9/11,” my American wife said as we stood among a small crowd staring at the tea light candles, faded flowers, makeshift but heartfelt texts, photos and flags around the Monument de la République. We swore inwardly to abide by the virtues of liberty, equality, fraternity. Nobody spoke; several sobbed; all grieved. A few hundred metres away down the Boulevard Voltaire, by the Bataclan music venue, still promoting the Eagles of Death Metal, even more people gathered silently; some hung their heads as if in prayer outside and across the road by park railings festooned with even more placards: “I’m a Muslim but they didn’t speak for me, I’m for peace”; “Save the planet – and its people: Peace;” “We’re not even afraid” and scores more. The overwhelming majority of these texts were about shared humanity and common values. They defied fear. In New York (where I went three weeks after the 9/11 attacks) there was a more palpably hysterical reaction. Goaded by George W Bush, even liberal New Yorkers took to ultra-patriotic displays of flags and badges and the cops were everywhere. Even three months later, during and after Thanksgiving and in the run-up to New Year, streets (and many bars) emptied swiftly when offices closed. In the French capital there are rather few tricolores in windows and on balconies in the 10th and 11th districts where the jihadis struck. Cosmopolitan young people – and their elders – defiantly carry on as normal. 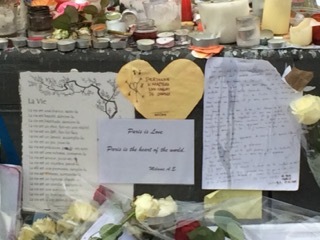 “Je suis en terrasse/ et je bois une bière/en écoutant de la musique/avec mes amis/qui ne sont pas/de la même/couleur que moi/ni de la même religion …et on refait le monde” is the slogan summing up the mood. Yet all these solemn and moving affirmations of love, these fresh commitments to France’s republican values, are accompanied by, almost drowned out by, the clamour for war against ISIS/Daesh – re-launched by Hollande on the very night of the attacks. Polls suggest a majority of French people back him and shares his anger over the murderous attacks – and Marine Le Pen, Front National leader, could be heading for an historic victory in regional elections on December 5 and 12 on a platform of closing down mosques and borders. Nicolas Sarkozy, ex-president heading the so-called Les Républicains, is rushing to the Right to try and steal her thunder. There’s clear evidence too that the state of emergency imposed by Hollande – and due to last for three months at least – is being used by the police and other counter-terrorist officers to systematically remove civil rights – the very republican values we are all reaffirming. It’s not just – though that is bad enough – the ban on demos during the COP21 climate change conference. It’s the arbitrary detentions and house-arrests imposed on Muslims for allegedly – often on the flimsiest of suspicions – supporting, aiding and abetting Daesh. And now, on the eve of the Commons vote on sending British warplanes to bomb Raqqa and other Daesh strongholds in Syria, Barbara’s words have acquired added meaning for us too: “For whom, how when and why?…That’s enough of your violence.” The rush to (extended) war will, we know, inflict more violent suffering and death on innocents; there is no evidence it will prevent further attacks on European and other cities. The arguments and counter-arguments are being made aplenty and will be repeated in the Commons chamber. There’s no need to reprise them here. Angus Robertson, SNP MPs’ leader, has made the case against air strikes consistently and cogently as here while proponents of them such as Jonathan Powell, Tony Blair’s ex-chief-of-staff, can see merit in accompanying political measures, up to and including talking to ISIS leaders (as Thatcher’s government did with the IRA). 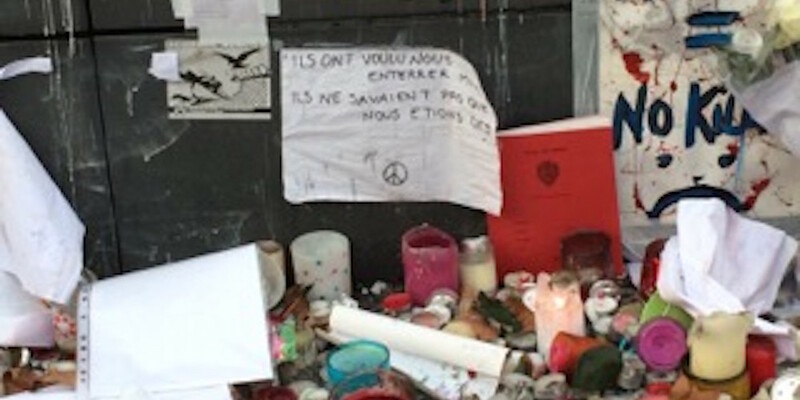 What would the predominantly young 130 victims of the Paris attacks want us to do? Obviously, we don’t know. But we, protagonists and opponents of bombing raids, surely owe it to them – “this generation that represents the face of France” in Hollande’s words – and others of their age around the world to come up with some real answers that could prevent similar events. There is a glaring absence of these so far. Troops on the ground, getting rid of/accepting Assad, stopping Gulf states arming ISIS, a proper reconstruction plan for post-civil war Syria…are all put forward. But, given the extreme conflicts of interest at work in the region, how realistic are any of these? On balance, I’m against air strikes, not least because of their likely impact upon civilians, but I simply don’t know how best to promote a non-military resolution of these myriad conflicts that is certain to provide some succour in death to the 130 victims (and the countless others before and after them). Our political class, in France, the UK, Scotland and elsewhere, has got to produce some genuine answers. Otherwise, all those fine words about love of life will mean not a jot.